Alvi Armani's Vitruvian method focuses on Vitruvian Design, natural hairlines, maximum density and strategic placement. Early teachings of famed Roman architect Marcus Vitruvius Pollio, inspired Vitruvian design. He taught us that a structure must possess firmitas, utilitas and venustas; it must be strong, useful and aesthetically pleasing. Marcus Pollio later turned his attention to what he considered the ideal work of art ever created... the Human Form. He compiled his work in the renowned book 'De Archetura'. Leonardo Da Vinci, master artist and inventor during the Italian Renaissance, inspired by early teachings of Marcus Vitruvius Pollio sketched 'Vitruvian Man'. Dr. Antonio Armani studied both influential characters. He was moved by the contributions offered by Marcus Vitruvius Polio and Leonard de Vinci to cosmetic surgery and hair restoration. Vitruvian Method encompasses Vitruvian Design, natural hairlines, maximum density, strategic placement, temple angle closure and Maximus FUE culminating undetectable hair transplant. The Alvi Armani medical team is taught unique artistic approaches inspired by Leonardo Da Vinci, and Marcus Vitruvius Pollio of Italy/Rome. The hair loss procedure known as Vitruvian method, is responsible for a new era in the world of hair transplants. 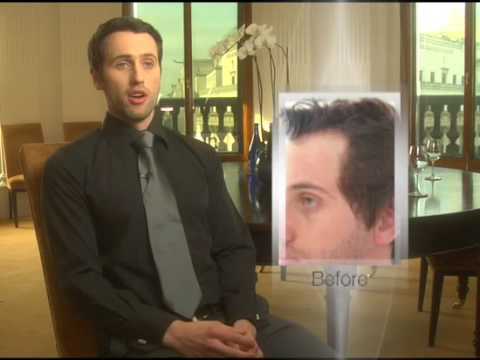 Alvi Armani hair transplants reach benchmark levels utilizing artistic brilliance, with the Vitruvian designs technically advanced donor hair extraction technique "Maximus - FUE". Large numbers of follicular units (4000+) are delicately removed in a single daily session. Abolishing major surgical instruments shortens healing time and minimizes pain. Dr. Armani's proprietary scientific technology reinvents follicular unit extraction (FUE), achieving a new level of excellence. Hair transplant procedures have steadily evolved over the years, both in the Extraction and the Restoration process. Alvi Armani has been leading research and development aimed at giving patients the latest technological advancements. The Vitruvian FUE method is a new revolutionary hair transplant procedure that innovates both in the Extraction and Restoration process. The number of men and women demanding the new technology is growing rapidly, bringing in a whole new era in hair transplant procedures. The doctor will select the proper quantity and quality of donor hair from the back and sides of the patient's head. The hair is carefully chosen to match the texture of the hair that was lost. The follicles are then delicately removed and prepared for the transition. There are two extraction methods widely used: F.U.S.S. (Follicular Unit Strip Surgery) and F.U.E. (Follicular Unit Extraction). Although the names of the extraction methods have become the primary means of differentiating the procedures, it is important to understand that the removal of the follicle is only part of the process. The objective of this part of the procedure is to achieve the successful removal of targeted follicles with the least invasive method possible. Alvi Armani has completely discontinued the use of the FUSS extraction method due to its highly invasive nature. The FUSS extraction method requires the removal of a large piece of tissue (typically from ear to ear) from the donor area. This leaves the patient with a long, linear scar, often preventing the patient from ever being able to wear a shorter hair style. Of greater concern is the fact that FUSS extraction method greatly diminishes the usable donor hair. This is due to the reduction in skin elasticity that occurs after each FUSS procedure. In addition to these issues, the FUSS method of extraction also increases recovery time and leads to unnecessary discomfort for the patient. Alvi Armani has developed its own proprietary Maximus FUE extraction process. Alvi Armani's trademark Maximus FUE process allows for the removal of each hair, one by one via a microscope, without the use of a scalpel. It allows for the extraction of 4000+ follicular units in a single day session. Removing individual follicles with a microscopic instrument allows the skin to heal quickly and naturally. Patients receive greater freedom regarding hair styling choices and a diminished healing time, allowing them to return to the normal activities of life sooner. After the extraction process is completed, the follicles are relocated to the area of the scalp that has experienced loss. Typically the balding areas in need of restoration are the hairline, mid head and/or crown. In order for this process to be successful the following elements must be taken into account: hairline shape and placement, temple angle shape and placement, hair density, hair angling, angle variance and natural hair grouping design. Most clinics use outdated techniques that result in low density and yield unnaturally designed hair lines, resulting in a detectable outcome. Alvi Armani has developed its own proprietary Vitruvian Design restoration process which duplicates naturally growing hair design. In combination with our Maximus FUE extraction method we are able to exercise greater control over the selection and placement of appropriate donor hair, with which we can design a totally full and natural looking hairline, transitioning seamlessly into the hair on the top, back and sides. The final results - a restored sense of confidence and a head of hair you can finally be proud of. The procedure will last anywhere from 6 to 16 hours depending on number of grafts. All preoperative and postoperative information, consents and other relevant paperwork will be provided to the client in advance to read and ask questions. Blood tests and a family doctor's medical are required prior to the procedure. Your head will be shaved prior to the procedure for optimal extraction and implantation of the grafts. Exception to shaving of the recipient area is offered in the Executive Sessions. Some swelling of the face will occur postoperatively due to the anesthetic fluid used; the swelling may last 2-5 days postoperatively. Medications for pain, swelling and infection prevention will be provided postoperatively. All patients will have a postoperative follow-up in the clinic the day after their procedure. Patient who are travelling by air with a flight time greater than 5 hours must stay in the location of their procedure for 7 days. The cabin air may dry out and potentially kill the grafts and thus affecting their growth. Some redness of the front hairline are may be visible initially and fade to a dull pink color over the next 3 months. Hats are not to be worn over the grafted areas for 4 weeks. Exercise involving aerobics, lifting weights is not allowed for 4 weeks. Sun exposure of grafted areas is to be avoided for 3-6 months. Swimming with the head under water is not allowed for 1 year. Growth of new hair occurs gradually.